Methuen’s Two Shilling Novels were one of numerous similar cheap hardcover reprint series issued by the publisher in the first three decades of the century. Other similar series include Methuen’s Shilling Library, Shilling Novels, and Cheap Novels. There seems to be an earlier series which Methuen called Methuen’s Two-Shilling Novels (with the dash) issued from about 1906-1925. 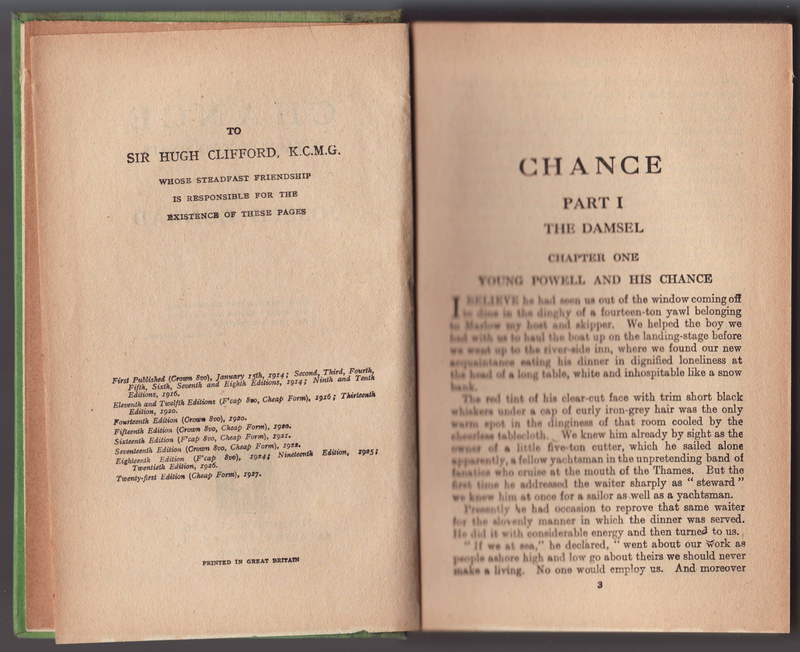 The Two Shilling Novels (without the dash) seemed to contain less than 10 titles and were only sold for a few years in the late 1920s. 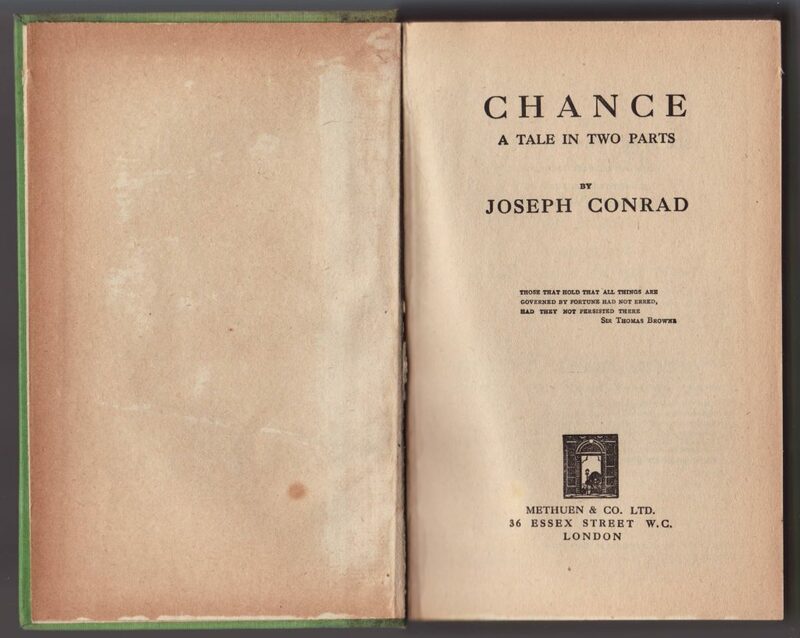 The jacket for Joseph Conrad’s Chance, published in 1927, is unique to the title. 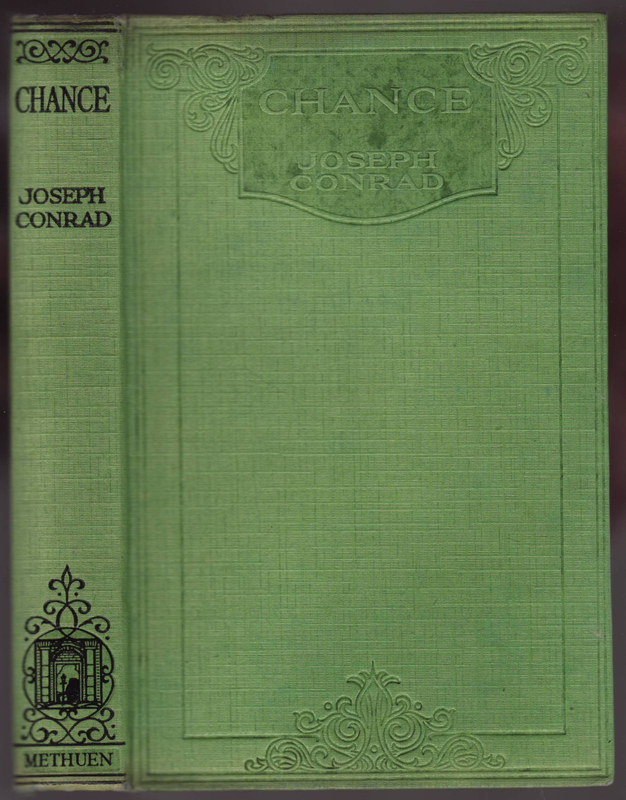 The jacket spine, in the tradition of fitting advertising on the jacket spine, contains the title, author, publisher, price and a brief description of the book. The front of the jacket contains a color illustration from the book (which is otherwise not illustrated). The front jacket flap advertises the series, with 6 titles, not including Chance. 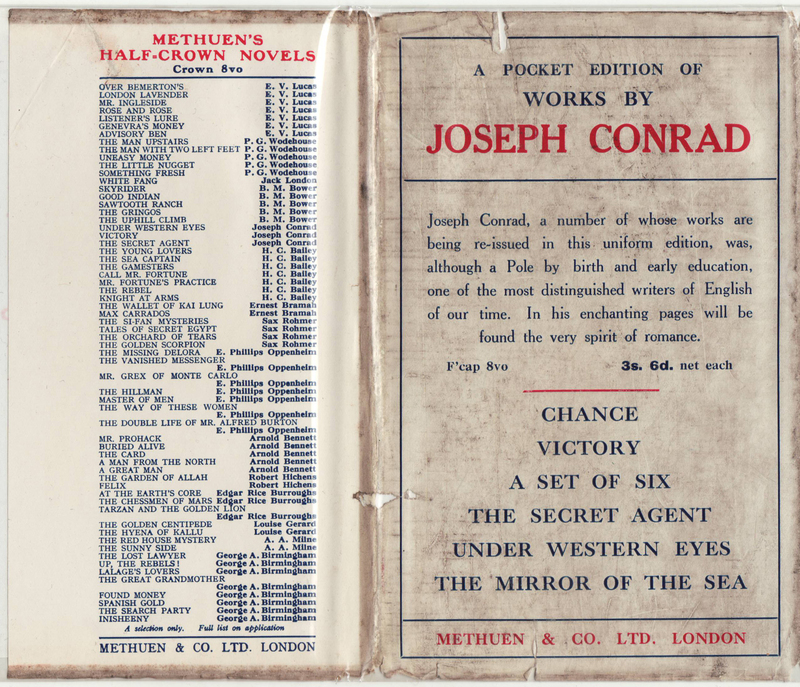 The rear of the jacket advertises “A Pocket Edition of Works By Joseph Conrad” at 3s/6d each, listing six titles (including Chance). 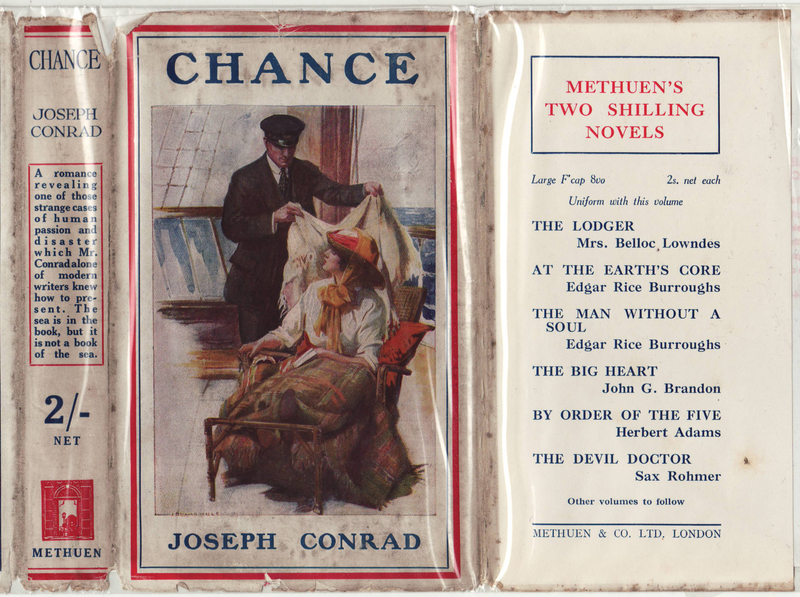 Several more Conrad titles are available in the series advertised on the rear jacket flap – Methuen’s Half-Crown Novels. In essence, Methuen was offering books – and sometimes the same title – at different price points. The bindings are simulated cloth material with black typography and decorations on the spine, and a debossed design and type on the front of the book. Cheap paper, now yellowing, along with a weak spine are common for these low-end series books. There is no half-title page. The title page includes a quote from Sir Thomas Browne. 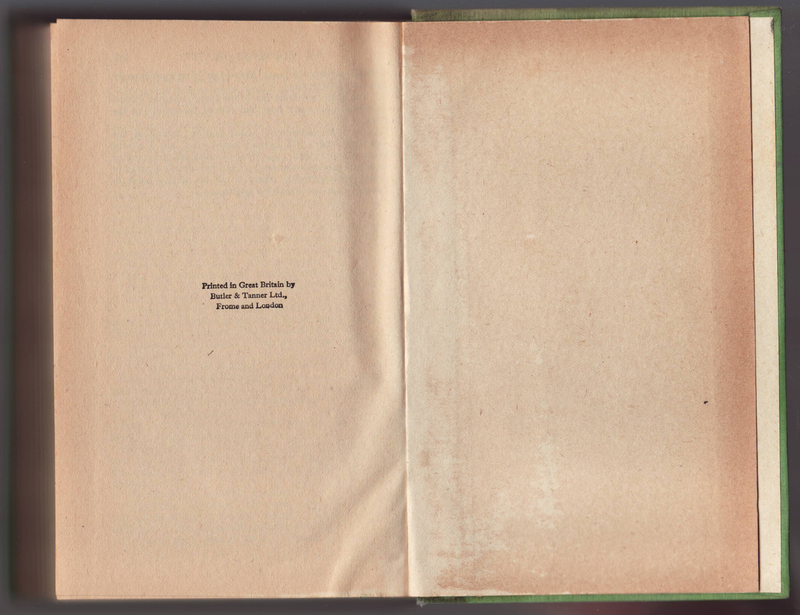 The copyright page includes a dedication as well as a detailed printing history of the book. First published in 1914, the book went through twenty editions (the last in 1926) before this, the first printing in “cheap form” in 1927. “Printed in Great Britain” is included on the copyright page. The printer, Butler and Tanner, Ltd. is printed on the last page of the book.